This construction video tutorial provides useful information for the students who will appear in SSC and JE exam. The video is presented by the renowned civil engineer Mr. Parag Pal and it sheds light on cement hydration process. Mr. Pal briefly explains the term rate of heat liberation throughout pouring of concrete. When series of unchangeable exothermic chemical reactions occur among cement and water, it is defined as hydration. With existence of water, the silicates and aluminates develop the products of hydration which in due course form a rigid (solid) and hard mass i.e. the hydrated cement paste. 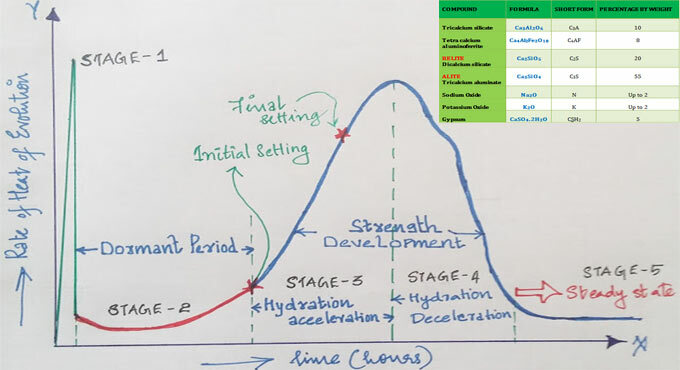 Production of hydration products ultimately results in stiffening (loss of adaptability), setting (consolidation), hardening (strength gain). Hydration process is ceaseless still the heat and moisture exist in the cement. Assure the strength and longevity of concrete. Identify and alleviate the stresses to resist cracking. Recognize the significance of superior curing and construction practices. Go through the following video tutorial to learn the detail hydration process.